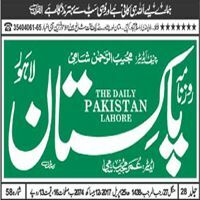 Pakistan News Today is an online newspaper published in Urdu language from Lahore Pakistan. Pakistan News Today provides latest Urdu news updates 24 hours. It also provides a special section for local news about business health and politic information, pictures, videos, personalities interviews,Urdu Column as well as a special featured section for most favorite FM radio program DADA POTA. Pakistan News Today is the Online Urdu Newspaper which have correspondents in almost in every city of Pakistan. It is also the first online Urdu Unicode newspaper, which offers public to publish their news articles, Urdu column, opinions,by their name. For Those Who Want to Read Pakistan News Today they can Visit its Official Website: www.pakistannews.today. At The Website You Will Find Pakistan News Today old Newspaper Too. You Are Visiting Pakistan News Today Page of Epaper.PkNewspapers.com.